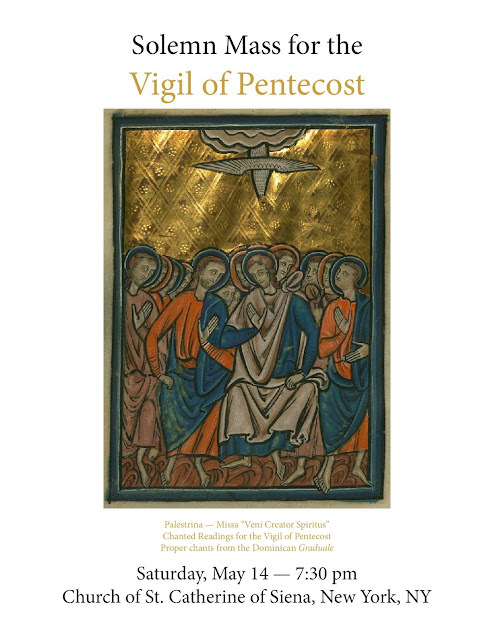 On Saturday, May 14, 2016 at 7:30 pm, a Solemn Mass for the Vigil of Pentecost will be celebrated at the Church of St. Catherine of Siena, located at 411 East 68th Street in New York City. The Mass will be an extended vigil, including the four additional readings and prayers added to the Vigil of Pentecost by Pope Benedict XVI in 2008. The ordinary of the Mass will be the Missa “Veni Creator Spiritus” by Palestrina, sung by the Schola Dominicana of St. Catherine of Siena under the direction of James D. Wetzel. The readings will be chanted and accompanied by chants from the Dominican Graduale.